Homelessness in the United States is an area of concern for social service providers, government officials, policy professionals, and society at large. 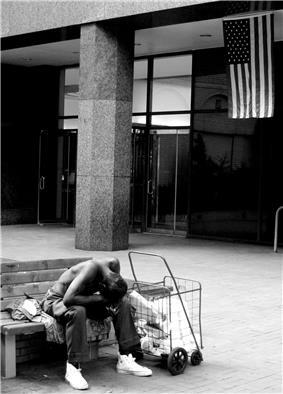 The U.S. Department of Housing and Urban Development in January 2012 annual point-in-time count found that 633,782 people across America were homeless. With 2007 as a benchmark, the data from the report showed a 6.8 percent decline in homelessness among individuals, a 3.7 percent decline of homeless families, a 13.1 percent decline of the unsheltered homeless population, and a 19.3 percent decline in persons experiencing chronic homelessness. During the overall count, 62,619 veterans were found homeless nationwide. One out of 50 children or 1.5 million children in America will be homeless each year. In 2013 that number jumped to one out of 30 children, or 2.5 million. There were an estimated 57,849 homeless veterans estimated in the United States during January 2013; or 12 percent of all homeless adults. Just under 8 percent of homeless U.S. veterans are female. Texas, California and Florida have the highest numbers of unaccompanied homeless youth under the age of 18; comprising 58% of the total homeless under 18 youth population  Because of turnover in the homeless population, the total number of people who experience homelessness for at least a few nights during the course of a year is thought to be considerably higher than point-in-time counts. A 2000 study estimated the number of such people to be between 2.3 million and 3.5 million. According to Amnesty International USA, vacant houses outnumber homeless people by five times. Homeless Without Shelter: The individual or family uses a primary nighttime residence that is a public or private place not designed for—or ordinarily used as—a regular sleeping accommodation for human beings (e.g., car, park, abandoned building, bus or train station, airport, camping ground). Homeless With Shelter: The individual or family lives in a supervised, publicly or privately operated shelter designated to provide temporary living arrangements (e.g., congregate shelters, transitional housing, hotels and motels paid for by charitable organizations or by federal, state, or local government programs for low-income individuals). Homeless Due to Institutional Release: The individual is exiting an institution where he or she resided for no more than 90 days, and the individual resided in an emergency shelter or place not meant for human habitation immediately before entering that institution. Imminence of Loss: The primary nighttime residence will be lost within 14 days. Lack of Alternate Housing: The individual or family has not arranged for a new primary nighttime residence after the current residence is lost. Lack of Support: The individual or family lacks the resources or support networks needed to obtain other permanent housing (e.g., family, friends, faith-based or other social networks). Lack of Permanent Housing: must have not had a lease, ownership interest, or occupancy agreement in permanent housing at any time during the last 60 days. Persistence of Housing Instability: must have moved primary nighttime residences at least twice during the last 60 days. Any other dangerous or life-threatening condition that relates to violence against the individual or a family member (including a child). made the individual or family afraid to return to their primary nighttime residence. Lack of Alternate Housing: The individual or family has no other residence to flee to. Lack of Support: The individual or family lacks the resources or support networks to obtain other permanent housing (e.g., family, friends, faith-based or other social networks). Juxtaposition of homeless and well off is common on Broadway, New York City. Deprived of normal childhoods, nearly half of foster children in the United States become homeless when they are released from foster care at age 18. People who have served time in prison, have abused drugs and alcohol, or have a history of mental illness find it difficult to impossible to find employment for years at a time because of the use of computer background checks by potential employers. According to the U.S. Conference of Mayors, the demand for emergency shelter in 270 U.S. cities increased 13% in 2001 and 25% in 2005. 22 percent of those requesting emergency shelter were turned away. Traditionally single men have constituted the majority of the homeless. In the 1980s there was a sharp rise in the number of homeless families in certain parts of the United States; notably New York City. Most homeless families consist of a single mother and children. A significant number of homeless people are teenagers and young adults, mostly runaways or street children. A 1960 survey by Temple University of Philadelphia's poor neighborhoods found that 75% of the homeless were over 45 years old, and 87% were white. In 1986, 86% were under age 45, and 87% were minorities. According to the US Department of Housing and Urban Development's 2008 Annual Homeless Assessment Report, the most common demographic features of all sheltered homeless people are: male, members of minority groups, older than age 31, and alone. More than two-fifths of sheltered homeless people have a disability. At the same time, sizable segments of the sheltered homeless population are white, non-Hispanic (38 percent), children (20 percent), or part of multi-person households (33 percent). Approximately 68 percent of the 1.6 million sheltered homeless people were homeless as individuals and 32 percent were persons in families. In 2008 more than two-thirds of all sheltered homeless people were located in principal cities, with 32 percent located in suburban or rural jurisdictions. About two-fifths of people entering an emergency shelter or transitional housing program during 2008 came from another homeless situation (sheltered or unsheltered), two-fifths came from a housed situation (in their own or someone else's home), and the remaining one-fifth were split between institutional settings or other situations such as hotels or motels. Most people had relatively short lengths of stay in emergency shelters: three-fifths stayed less than a month, and a third stayed a week or less. Homeless individuals report a lack of non-profit organizations are in operation to serve this need—for example, the National Low Income Housing Coalition—but most lack the funding necessary to create enough housing. Several proposed policy measures are designed to secure such funding, such as the National Housing Trust Fund, but these have not been signed into law. Homeless individuals report mental illness as being the number three reason for becoming or staying homeless. Such illnesses are often closely linked with the fourth reason—substance abuse—and therefore it is generally accepted that both of these issues should be treated simultaneously. Although many medical, psychiatric, and counseling services exist to address these needs, it is commonly believed that without the support of reliable and stable housing such treatments remain ineffective. Furthermore, in the absence of a universal health-care plan, many of those in need cannot afford such services. Legislation such as the Bringing America Home Act, if enacted, would provide comprehensive and available treatment for all. The homeless community of the United States is aided in many ways from governmental and non-governmental organizations. Non-governmental organizations help the homeless by advocating or by physical and financial aid. Organizations like the National Alliance to End Homelessness go to government officials and offices to speak on behalf of the homeless community calling for policy changes or for the creation of policy to help end homelessness. Government agencies respond. The following programs and policies acknowledge the phenomenon of homelessness, provide help to the homeless, and prevent further growth of the homeless population. Many programs that are designed to assist the homeless population have incorporated some type of housing program for their clients. Whether it is a transitional, permanent or even emergency housing program, the assistance is often provided for a very low cost and maybe even free. In the United States each year, there are around 3.5 million people who live their lives without shelter or a stable occupation. For 2006 alone, $28.5 billion was allotted to homeless programs ran through HUD (Housing and Urban Development), $1 billion was given for Section 8 housing, and $1.4 billion was used for Homeless Assistance Grants. As one example, Volunteers of America is an agency that believes preventing family homelessness is a critical part of their organization. Through them, transitional housing and emergency shelters are available to those who are in desperate need. Transitional housing programs are operated with one goal in mind – to help individuals and families obtain permanent housing as quickly as possible. Transitional housing programs assist homeless for a fixed amount of time or until they are able to obtain housing on their own and function successfully in the community, or whichever comes first. For a significant number of homeless Americans with mental or physical impairments, often coupled with drug and/or alcohol use issues, long-term homelessness can only be ended by providing permanent housing coupled with intensive supportive services. Permanent housing provides a "base" for people to move out of poverty. Without supportive services, housing is not often enough to end homelessness. Various agencies, in fact all homeless prevention agencies and programs include substance abuse recovery and prevention programs. Objectives are to provide substance abuse counseling and access to treatment centers. There are several policies dealing with homelessness. In 1980 the government decided to start sending funding to the homeless, but it was not until 1984 that shelters were built to accommodate and feed them. As it was shown though seventy percent required the homeless to attend a religious ceremony and spend only a couple of nights there. In the 1987 McKinney Act the problem with homelessness became known as a huge social problem. Later on, the No Child Left Behind Act of 2001 (P.L. 107-110) amended the program explicitly to prohibit states that receive McKinney-Vento funds from segregating homeless students from non-homeless students, except for short periods of time for health and safety emergencies or to provide temporary, special, supplementary services. The Chronic Homelessness Initiative. The Bush Administration established a national goal of ending chronic homelessness in ten years, by 2012. The idea of a 10-year plan to end chronic homelessness began as a part of a 10-year plan to end homelessness in general adopted by the National Alliance to End Homelessness (NAEH) in 2000. The following year, then-Secretary Martinez announced HUD's commitment to ending chronic homelessness at the NAEH annual conference. In 2002, as a part of his FY2003 budget, President Bush made "ending chronic homelessness in the next decade a top objective." The bi-partisan, congressionally mandated, Millennial Housing Commission, in its Report to Congress in 2002, included ending chronic homelessness in 10 years among its principal recommendations. By 2003, the Interagency Council on Homelessness had been re-engaged and charged with pursuing the President's 10-year plan. The Administration has recently undertaken some collaborative efforts to reach its goal of ending chronic homelessness in 10 years. On October 1, 2003, the Administration announced the award of over $48 million in grants aimed at serving the needs of the chronically homeless through two initiatives. The "Ending Chronic Homelessness through Employment and Housing" initiative was a collaborative grant offered jointly by HUD and the Department of Labor (DOL). The initiative offered $10 million from HUD and $3.5 million from DOL to help the chronically homeless in five communities gain access to employment and permanent housing. Section 8 is the core housing program that helps extremely low-income families accommodate the gap between their incomes below 30 percent of the median income for each community. The government assists homeless families by awarding grants and vouchers. Vouchers are available to the families who are most needy and they are used to pay for housing found in the private market. Currently there are policy changes in who receives vouchers and there will be a reduction in the amount of vouchers granted to the homeless population. On May 20, 2009, President Barack Obama signed the Homeless Emergency Assistance and Rapid Transition to Housing (HEARTH) Act of 2009. The HEARTH Act amends and reauthorizes the McKinney-Vento Homeless Assistance Act with substantial changes. The HEARTH Act of 2009 consolidated HUD's competitive grant programs, created a Rural Housing Stability Program, changed HUD's definition of homelessness and chronic homelessness, supplied a simplified match requirement, increased prevention resources and increased in the emphasis on performance. The primary purpose of the legislation was to provide principal definitions regarding homelessness. The following terms: "homeless," "homeless individual," "homeless person," and "homeless individual with a disability." A significant shift has occurred in homeless services over the past five years which has changed the emphasis from "managing the problem of homelessness" with emergency shelters, soup kitchens and health clinic to ending homelessness by housing individuals who are experiencing homelessness. In 2000, the National Alliance to End Homelessness released "A Plan, Not a Dream: How to End Homelessness in Ten Years" which encouraged communities to develop and implement 10-year plans to end homelessness in their communities. Shelter Plus Care – a federal program that provides housing subsidies and are matched by local funds to provide long-term supportive services (typically case management). Experience demonstrated that many individuals who have been homeless for a significant time often lose their housing shortly after placement. The Shelter Plus Care program provides long-term supports including working with the landlord to keep the individual housed. Housing First – a service paradigm that assumes that individuals who are homeless are "ready" to be housed immediately and with appropriate supports can retain their housing. The Pathways to Housing project in New York demonstrated a five-year housing retention rate of 88 percent among formerly homeless individuals with serious mental illness. Homeless people seeking help are often required to participate in substance abuse, mental health, and life skills programs of a year or more regardless of whether those are factors in their case. Many people only need decent housing to get back on their feet. Central City Concern's (Portland, Oregon) Shoreline Project allows homeless unemployed men to move into SRO type single person studios and find a job within 70 days; it's been a great success with expected expansion of the program in 2007. Assertive Outreach – a form of engagement and outreach that emphasizes building a bond of trust between the case worker and the individual. Engagement is highly individualized with the pace dictated by the individual in need. Case workers do not force rules, regulations or program services until they are requested. Typically used to engage homeless, mentally ill individuals. In Boston, Massachusetts, in September 2007, an outreach to the homeless was initiated in the Boston Common, after some arrests and shootings, and in anticipation of the cold winter ahead. This outreach targets homeless people who would normally spend their sleeping time on the Boston Common, and tries to get them into housing, trying to skip the step of an emergency shelter. Applications for Boston Housing Authority were being handed out and filled out and submitted. This is an attempt to enact by outreach the Housing First initiative, federally mandated. Boston's Mayor, Thomas Menino, was quoted as saying "The solution to homelessness is permanent housing". Still, this is a very controversial strategy, especially if the people are not able to sustain a house with proper community, health, substance counseling, and mental health supportive programs. In June 2012, Governor Lincoln Chafee of Rhode Island signed a bill into law which gives homeless people in that state some clearer rights than before. Perhaps the most accurate, comprehensive, and current data on homelessness in the United States is reported annually by the Department of Housing and Urban Development (HUD) in the Annual Homeless Assessment Report to Congress (AHAR), released in June of every year since 2007. The AHAR report relies on data from two sources: single-night, point-in-time counts of both sheltered and unsheltered homeless populations reported on the Continuum of Care applications to HUD; and counts of the sheltered homeless population over a full year provided by a sample of communities based on data in their Management Information Systems (HMIS). As many as 3.5 million people experience homelessness in a given year (1% of the entire U.S. population or 10% of its poor), and about 842,000 people in any given week. Most were homeless temporarily. The chronically homeless population (those with repeated episodes or who have been homeless for long periods) fell from 175,914 in 2005 to 123,833 in 2007. 22% are considered to have serious mental illnesses, or are disabled. 38% have alcohol abuse problems. 26% have other substance abuse problems. 26% report acute health problems other than HIV/AIDS such as tuberculosis, pneumonia, or sexually transmitted infections. 46% report chronic health conditions such as high blood pressure, diabetes, or cancer. 55% report having no health insurance (compared to 27% of general population). 58% report having trouble getting enough food to eat. 38% have less than a High School diploma. 34% have a High School diploma or equivalent (G.E.D.). 28% have more than a High School education. 44% report having worked in the past week. 50% receive less than $300 per month as income. 70% work on street corners, pan-handling or prostituting themselves. Additionally, a 2010 longitudinal study of homeless men conducted in Birmingham, Alabama found that most of them earned ninety dollars a week on average while working thirty hours a week on average. 80% of those who experience homelessness do so for less than 3 weeks. They typically have more personal, social, or economic resources to draw upon. 10% are homeless for up to two months. They cite lack of available or affordable housing as responsible for the delay. 10% are so called "chronic" and remain without housing for extended periods of time on a frequent basis. *This survey has omitted the percentage who are not chronically homeless but were homeless for an average time such as a year or two. Since the housing market fall out there has been a rise in the number of homeless students. NAEHCY or the National Association for the Education of Homeless for Children and Youth, has reported a 99% increase in homeless students within a three-month period (San Diego). Of 1,636 schools, 330 reported no increase, 847 reported an increase of half, and 459 reported an increase of 25% or more. Due to the provisions of the McKinney-Vento Act many school districts are struggling to provide the necessary services, such as rising transportation needs and the greater severity of services. This is especially worrisome since homeless students are 1) 1.5 times more likely to perform below grade level in reading; 2)1.5 times more likely to perform below grade level in spelling; and 3) 2.5 times more likely to perform below grade level in math. There are a few worries that there will be false reports of homeless students, but mostly it's not an issue. There has been concern about the transmission of diseases in the homeless population housed in shelters, and the people who work there, especially with tuberculosis. A 2011 study led by Dr. Rebecca T. Brown in Boston, Massachusetts conducted by the Institute for Aging Research (an affiliate of Harvard Medical School), Beth Israel Deaconess Medical Center, and the Boston Health Care for the Homeless Program found the elderly homeless population had "higher rates of geriatric syndromes, including functional decline, falls, frailty and depression, than seniors in the general population and that many of these conditions may be easily treated if detected". The report was published in the Journal of Geriatric Internal Medicine. Many advocates for the homeless contend that a key difficulty is the social stigma surrounding homelessness. Many associate a lack of a permanent home with a lack of a proper bathroom and limited access to regular grooming. Thus, the homeless become “aesthetically unappealing” to the general public. Research shows that “physically attractive persons are judged more positively than physically unattractive individuals on various traits…reflecting social competence." In addition to the physical component of stigmatization exists an association of the homeless with mental illness. Many people consider the mentally ill to be irresponsible and childlike and treat them with fear and exclusion, using their mental incapacitation as justification for why they should be left out of communities. There is anecdotal evidence that many Americans complain about the presence of homeless people, blame them for their situation, and feel that their requests for money or support (usually via begging) are unjustified. In the 1990s, particularly, many observers and media articles spoke of "compassion fatigue" a belief that the public had grown weary of this seemingly intractable problem. A common misconception persists that many individuals who panhandle are not actually homeless, but actually use pity and compassion to fund their lifestyles, making up to $20 an hour and living luxurious lives. This exception to the rule seems more prevalent due to media attention, but in reality, only a few cases exist. Public opinion surveys show relatively little support for this view, however. A 1995 paper in the American Journal of Community Psychology concluded that "although the homeless are clearly stigmatized, there is little evidence to suggest that the public has lost compassion and is unwilling to support policies to help homeless people." A Penn State study in 2004 concluded that "familiarity breeds sympathy" and greater support for addressing the problem. A 2007 survey conducted by Public Agenda, a nonprofit organization that helps leaders and their citizens navigate through complex social issues, found that 67 percent of New Yorkers agreed that most homeless people were without shelter because of "circumstances beyond their control," including high housing costs and lack of good and steady employment. More than one-third (36 percent) said they worried about becoming homeless themselves, with 15 percent saying they were "very worried." More interestingly, 90 percent of New Yorkers believed that everyone has a right to shelter, and 68 percent believed that the government is responsible for guaranteeing that right to its citizens. The survey found support for investments in prevention, rental assistance and permanent housing for the homeless. Public Agenda has also concluded, however, that the public's sympathy has limits. In a 2002 national survey, the organization found 74 percent say the police should leave a homeless person alone if he or she is not bothering anyone. Yet , contradictingly, 71 percent say the police should move the homeless if they are keeping customers away from a shopping area and 51 percent say the homeless should be moved if they are driving other people away from a public park. Various laws have both directly and indirectly criminalized the homeless and people attempting to feed homeless people outdoors. At least 31 cities have criminalized feeding the homeless. The City could not expressly criminalize the status of homelessness by making it a crime to be homeless without violating the Eighth Amendment, nor can it criminalize acts that are an integral aspect of that status. Because there is substantial and undisputed evidence that the number of homeless persons in Los Angeles far exceeds the number of available shelter beds at all times, including on the nights of their arrest or citation, Los Angeles has encroached upon Appellants' Eighth Amendment protections by criminalizing the unavoidable act of sitting, lying or sleeping at night while being involuntarily homeless. … the Eighth Amendment prohibits the City from punishing involuntary sitting, lying, or sleeping on public sidewalks that is an unavoidable consequence of being human and homeless without shelter in the City of Los Angeles. … By our decision, we in no way dictate to the City that it must provide sufficient shelter for the homeless, or allow anyone who wishes to sit, lie, or sleep on the streets of Los Angeles at any time and at any place within the City. All we hold is that, so long as there is a greater number of homeless individuals in Los Angeles than the number of available beds, the City may not enforce section 41.18(d) at all times and places throughout the City against homeless individuals for involuntarily sitting, lying, and sleeping in public. In August 2007, in Boston, Massachusetts, the city took action to keep loiterers, including the homeless, off the Boston Common overnight, after a series of violent crimes and drug arrests. In August 2012, a federal district judge in Philadelphia ruled that laws prohibiting serving food to the homeless outdoors were unconstitutional. The past two decades have seen a growing number of violent acts committed upon people experiencing homelessness—the rate of such documented crimes in 2005 was 30% higher than of those in 1999. 75% of all perpetrators are under the age of 25. In recent years, largely due to the efforts of the National Coalition for the Homeless (NCH) and academic researchers, the problem of violence against the homeless has gained national attention. In their report: Hate, Violence, and Death on Mainstreet USA, the NCH reported 386 violent acts committed against homeless persons over the period, among which 155 were lethal. The NCH called those acts hate crimes (they retain the definition of the American Congress). They insist that so called bumfight videos disseminate hate against the homeless and dehumanize them. The Center for the Study of Hate & Extremism (CSHE) at  The CSHE contends that negative and degrading portrayals of the homeless contribute to a climate where violence takes place. Various studies and surveys indicate that homeless people have a much higher criminal victimization rate than the non-homeless, but that most incidents never get reported to authorities. A 2007 study found that the number of violent crimes against the homeless is increasing. In 2013 there were 109 attacks on homeless people, a 24 per cent increase on the previous year, according to the NCH. Eighteen people died as a result of the attacks. In July 2014 three boys 15, 16 and 18, were arrested and charged with beating to death two homeless men with bricks and a metal pole in Albuquerque. Many towns and cities had an area which contained the poor, transients, and afflicted, such as a "skid row". In New York City, for example, there was an area known as "the Bowery", traditionally, where alcoholics were to be found sleeping on the streets, bottle in hand. Rescue missions offering "soup, soap, and salvation", a phrase introduced by The Salvation Army, sprang up along the Bowery thoroughfare, including the oldest one, The Bowery Mission. The mission was founded in 1879 by the Rev. and Mrs. A.G. Ruliffson. The mission's parent organization, Christian Herald, once published "Christian Herald And Signs of Our Times". In relating the formation and origin of the mission in its March 27, 1895 edition it said: "Fifteen years ago, Rev. A.G. Ruliffson and Mrs. Ruliffson, long engaged in mission work in New York, decided to open an eastside mission for men." At the time the Bowery Mission was established it was located at 36 Bowery, a location that in an earlier time in New York City, played a role in the New York City Draft Riots, when the building was used as a saloon. An examination of the Annual Reports for the first decade of the mission, and period New York City newspapers starting in 1881, suggest that an 1880 date for the mission is more likely than 1879. To cite examples from period newspapers, The New York Tribune's article, "The Bowery Mission, A Sketch of its Career", dated March 14, 1898 opens with "The Bowery Mission was started in 1880 at No.36 Bowery by a number of men who were interested in mission work." 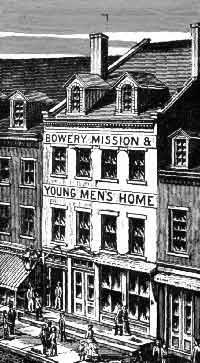 An even earlier article appearing in The New York Tribune on November 8, 1880, "A Bright Spot In The Darkness", declared "The Bowery Evangelical Mission, at No.36 Bowery, was opened yesterday afternoon with a prayer-meeting, at which some 150 persons were present." The present location of the Bowery Mission at 227–229 Bowery dates to 1909 when an abandoned coffin factory was converted to a mission. In smaller towns, there were hobos, who temporarily lived near train tracks and hopped onto trains to various destinations. Especially following the American Civil War, a large number of homeless men formed part of a counterculture known as "hobohemia" all over America. Jacob Riis wrote about, documented, and photographed the poor and destitute, although not specifically the homeless, in New York City tenements in the late 19th century. His ground-breaking book, How the Other Half Lives, published in 1890, raised public awareness of living conditions in the slums, causing some changes in building codes and some social conditions. In the 1930s, the Great Depression caused the return of the homeless. There were two million homeless people migrating around the country. One visible effect of the depression was the advent of Hoovervilles. Residents lived in shacks and begged for food or went to soup kitchens. Authorities did not officially recognize these Hoovervilles and occasionally removed the occupants for technically trespassing on private lands, but they were frequently tolerated out of necessity. In the United States, during the late 1970s, the deinstitutionalization of patients from state psychiatric hospitals was a precipitating factor which seeded the homeless population, especially in urban areas such as New York City. The Community Mental Health Act of 1963 was a pre-disposing factor in setting the stage for homelessness in the United States. Long term psychiatric patients were released from state hospitals into Single Room Occupancies and sent to community health centers for treatment and follow-up. It never quite worked out properly and this population largely was found living in the streets soon thereafter with no sustainable support system. In 1965, The Diggers, a community-action group dedicated to the concept of everything being free of charge, established soup kitchens and free health-care facilities in the Haight-Ashbury district of San Francisco. This also began a movement of people that began to travel for political reasons as well as for personal choices. This is where the beginnings of the American nomadic caravans became popular, living homelessly, but happily. In 1969 the Pine Street Inn was founded by Paul Sullivan on Pine Street in Boston's Chinatown district and began caring for homeless destitute alcoholics. In 1980, it moved to larger facilities on Harrison Avenue in Boston due to growing needs of the homeless population. In 1974, Kip Tiernan founded Rosie's Place in Boston, the first drop-in and emergency shelter for women in the United States, in response to the increasing numbers of needy women throughout the country. In 1979, a New York City lawyer, Robert Hayes, brought a class action suit before the courts, Callahan v. Carey, against the City and State, arguing for a person's state constitutional "right to shelter". It was settled as a consent decree in August 1981. The City and State agreed to provide board and shelter to all homeless men who met the need standard for welfare or who were homeless by certain other standards. By 1983 this right was extended to homeless women. The History of the United States (1980–1991) illustrates that this was a time when there was economic distress, high unemployment, and was the period when chronic homelessness became a societal problem. In 1980, federal funds accounted for 22% of big city budgets, but by 1989 the similar aid composed only 6% of urban revenue (part of a larger 60% decrease in federal spending to support local governments). It is largely (although not exclusively) in these urban areas that homelessness became widespread and reached unprecedented numbers. The 1980s also saw a continuing trend of deinstitutionalizing mental-health treatment. It is believed that a large percentage of these released patients ended up in the homeless system. Many existing shelters and soup kitchens had to expand their facilities to accommodate the larger number of homeless. For example, in 1980, the Pine Street Inn had to move to larger facilities on Harrison Avenue in Boston and in 1984, Saint Francis House had to move its operation from the St. Anthony Shrine on Arch Street to an entire ten-floor building on Boylston Street. The January 2, 1984 issue of Newsweek magazine had a front cover of the Reynolds family in Galveston, Texas, with the cover title, "Homeless in America", thereby bringing the homelessness issue to continued national attention. In response to the ensuing homelessness crisis of the 1980s, concerned citizens across the country demanded that the federal government provide assistance. After many years of advocacy and numerous revisions, President Reagan signed into law the McKinney-Vento Homeless Assistance Act in 1987—this remains the only piece of federal legislation that allocates funding to the direct service of homeless people. By the mid-1980s, there was also a dramatic increase in family homelessness. Tied into this was an increasing number of impoverished and runaway children, teenagers, and young adults, which created a new sub-stratum of the homeless population. The McKinney-Vento Act paved the way for service providers in the coming years. During the 1990s homeless shelters, soup kitchens, and other supportive services sprouted up in cities and towns across the nation. However, despite these efforts and the dramatic economic growth marked by this decade, homeless numbers remained stubbornly high. It became increasingly apparent that simply providing services to alleviate the symptoms of homelessness (i.e. shelter beds, hot meals, psychiatric counseling, etc. ), although needed, were not successful at solving the root causes of homelessness. Throughout this decade, homeless service providers and the Federal government have been able to reduce chronic homelessness and homelessness among Veterans with targeted efforts and interagency cooperation on initiatives like the HUD-VASH program. The 2000s, however, saw a new population of those experiencing homelessness: families with children. While an emerging problem at the beginning of the decade, the problem continued to persist through 2010. At the close of the decade the trend continued unabated, with the number of individuals in homeless families increasing from 431,541 in 2007 to 535,447 in 2009. Unfortunately, libraries are not always proactive in their service to the local homeless. As an article about a man in Belleville shows, not all homeless people are provided with ample access to the resources a library has to offer (Girresch, 2011). The Belleville Public Library invalidated the library card of the local man when the staff discovered that he was homeless and no longer had a permanent address. Steve Johnson, who had lost his job and subsequently his apartment last year, relies on the public library for Internet access to apply for jobs. Because his library card has been invalidated, he is limited to only 30 minutes of computer use a day—severely restricting his ability to hunt and apply for jobs online (Girresch, 2011). This situation, and others like it, call into question those library policies that begin to hinder the public that the library serves. How far should library policy reach? Are staff required to adhere to policy when it conflicts with a patron's right to information? What obligation does the library have to the homeless? The answers to these and other questions need to be defined. The Richard Kreimer case (noted below) helps to force public libraries to consider the issue, however more discussion needs to be initiated for public libraries to understand their role and their obligations towards homeless patrons. The San Jose University Library became one of the first academic libraries to pay attention to the needs of the homeless and implement changes to better serve this population. In 2007, the merged University Library and Public Library made the choice to be proactive in reaching out. Collaborations with nonprofit organizations in the area culminated in computer classes being taught, as well as nutrition classes, family literacy programs, and book discussion groups (Collins, 2009). After eighteen months, the library staff felt they still weren’t doing enough and “analyzed program participation trends supplemented by observation and anecdotes” in order to better understand the information needs of the homeless. When it was understood that these needs are complex, additional customer service training was provided to all staff who were interested (Collins, 2009, p. 112). Once the staff more fully understood the needs of the homeless, it was determined that many programs in place already would be helpful to the homeless with a few minor adjustments. Programs were tailored to meet these needs. Additional changes implemented included temporary computer passes and generous in-house reading space to counteract the policies in place that may prevent the homeless from obtaining a library card (Collins, 2009).New York Public Library offers services to those homeless residing in shelters. The news article and video entitled, “SF library offers Social Services to Homeless,” speaks about the step of SF library having a full time social worker at there library to reduce and help homeless patrons. It mentions that Leah Esguerra, who is a psychiatric social worker. Her usual routine is done by making her rounds to different homeless patrons and greeting them to see if she could help them. She offers help in different forms that could range from linking patrons with services or providing them with mental health counseling. She also supervises a 12-week vocational program that culminates in gainful employment in the library for the formerly homeless (Knight, 2010). The changes have garnered positive results from all patrons. Since this service started, staff at the library stated that they have noticed a drop in inappropriate behavior. The video entitled, “Libraries Should Welcome the Homeless,” is about a downtown Los Angeles public library that illustrates how important the library’s role is when it comes to homeless individuals. The video follows a homeless patron named, Phillip Sapple, who lost his job and home. He went to the library everyday since his lost job. The video mentions that Phillip is an artist and has started a small business by having patrons and staff draw pictures from photos. The Park Central Branch of the Free Library of Philadelphia has created a program called the H.O.M.E Page Cafe. The project is the result of a collaboration between the Free Library of Philadelphia and a local non-profit, Project H.O.M.E. The H.O.M.E Page Cafe is a coffee shop in the library that offers a number of beverages and snacks, much like the average cafe. However, the workers are formerly homeless living in supported housing that are hired based on potential and need. It is an active effort to help the homeless get back on their feet and provide them with training they can then use for future employment. More information about the H.O.M.E Page Cafe can be found on their website: http://www.projecthome.org/cafe/homepage.php. The U.S. Department of Housing and Urban Development estimated in 2013 the number of homeless in Washington, D.C. as 6,865, which was a 29 percent increase after 2007. D.C. ranks eighth regarding total homeless population among other major American cities. The city passed a law that requires to provide shelter to everybody in need when the temperature drops below freezing. Since D.C. does not have enough shelter units available, every winter it books hotel rooms in the suburbs with an average cost around $100 for a night. According to the D.C. Department of Human Services, during the winter of 2012 the city spent $2,544,454 on putting homeless families in hotels, and budgeted $3.2 million on hotel beds in 2013. The city of San Francisco, California has a significant and visible homeless problem. Approximately 61% of the homeless population were already living and working in San Francisco when they became homeless, indicating that a vast majority of people experiencing homelessness did not come to the city for its resources but rather are being priced out of their home. The city's homeless population has been estimated at 7,000–10,000 people, of which approximately 3,000–5,000 refuse shelter due to the conditions within the shelters including violence, racism, and homophobia and transphobia. Additionally, there are only 1,339 available shelter beds for the approximately 10,000 people sleeping outdoors. The city spends $200 million a year on homelessness related programs. On May 3, 2004, San Francisco officially began an attempt to scale back the scope of its homelessness problem by changing its strategy from cash payments to the "
In March 2010, there were protests about the Governor's proposed cut of $65 million in annual funding to the homeless adult services system. The Bloomberg administration announced an immediate halt to the Advantage program, threatening to cast 15,000 families back into the shelters or onto the streets. A court has delayed the cut until May 2011 because there was doubt over the legality of cancelling the city's commitment. However, the Advantage program itself was consciously advanced by the Bloomberg administration as an alternative to providing long-term affordable housing opportunities for the poor and working class. The result, as the [Coalition for the Homeless] report points out, is that "Thousands of formerly-homeless children and families have been forced back into homelessness, In addition, Mayor Bloomberg proposed $37 million in cuts to the city's budget for homeless services this year. The New York City Housing Authority is experiencing record demand for subsidized housing assistance. However, just 13,000 of the 29,000 families who applied were admitted into the public housing system or received federal housing vouchers known as [Section 8] in 2010. Due to budget cuts there have been no new applicants accepted to receive Section 8. Part of the problem lies with long-term joblessness that characterizes the United States' economic crisis. According to the Center for an Urban Future about a third of the adult workers in New York City are low-wage earners, making under $11.54 an hour. Affordable rent rates considered to be no more than a third of the renter's wages. A family in New York City must earn at least $54,000 to find an affordable home. The median household income for renters in the Bronx and Brooklyn is barely $30,000 and $35,000 respectively. According to the Community Service Society, "Two-thirds of poor New Yorkers and over one-third of near poor households—up to twice the poverty level—spend at least half of their incomes on rent…and place millions of low-income New Yorkers at risk of housing hardships and displacement." According to the NYC Department of Homeless Services, 64 percent of those applying for emergency shelter in 2010 were denied. Several were denied because they were said to have family who could house them when in actuality this might not have been the case. Applicants may have faced overcrowding, unsafe conditions, or may have had relatives unwilling to house them. According to Mary Brosnaham, spokeswoman for Coalition for the Homeless, the administration of Mayor Michael Bloomberg employs a deliberate policy of "active deterrence". 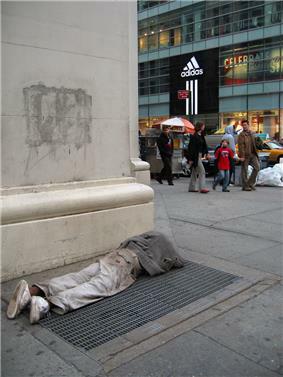 According to the Coalition for the Homeless, the homeless population of New York rose to an all-time high in 2011. A reported 113,552 people slept in the city's emergency shelters last year, including over 40,000 children; marking an 8 percent increase from the previous year and a 37 percent increase from 2002. There was also a rise in the number of families relying on shelters, approximately 29,000. That is an increase of 80% from 2002. About half of the people who slept in shelter in 2010 returned for housing in 2011. A homeless man down and out in New York City. There is sometimes corruption and theft by the employees of a shelter as evidenced by a 2011 investigative report by FOX 25 TV in Boston wherein a number of Boston public shelter employees were found stealing large amounts of food over a period of time from the shelter's kitchen for their private use and catering. In September 2010, it was reported that the Housing First Initiative had significantly reduced the chronic homeless single person population in Boston, Massachusetts, although homeless families were still increasing in number. Some shelters were reducing the number of beds due to lowered numbers of homeless, and some emergency shelter facilities were closing, especially the emergency Boston Night Center. Due to economic constraints in 2010, Governor Deval Patrick had to cut the Commonwealth of Massachusetts 2011 budget so dental care for the majority of adults, including most homeless people, covered by MassHealth (Medicaid) would no longer be provided except for cleaning and extractions, with no fillings, dentures, or restorative care. This does not affect dental care for children. The measure took effect in July 2010 and affects an estimated 700,000 adults, including 130,000 seniors. In 2010, there was a continued crackdown on panhandling, especially the aggressive type, in downtown Boston. Summonses were being handed out, with scheduled court appearances. The results were mixed and in one upscale neighborhood, Beacon Hill, the resolve of the Beacon Hill Civic Association, which has received only one complaint about panhandlers, was to try to solve the bigger problem not by criminal actions. In October 2009, as part of the city's Leading the Way initiative, Mayor Thomas Menino of Boston dedicated and opened the Weintraub Day Center which is the first city-operated day center for chronically homeless persons. It is a multi-service center, providing shelter, counseling, health care, housing assistance, and other support services. It is a 3,400-square-foot (320 m2) facility located in the Woods Mullen Shelter. It is also meant to reduce the strain on the city's hospital emergency rooms by providing services and identifying health problems before they escalate into emergencies. It was funded by $3 million in grants from the  and the United States Department of Health and Human Services Substance Abuse and Mental Health Services Administration (SAMHSA). In October 2008, Connie Paige of The Boston Globe reported that the number of homeless in Massachusetts had reached an all-time high, mostly due to mortgage foreclosures and the national economic crisis. In December 2007, Mayor Thomas M. Menino of Boston, announced that the one night homeless count had revealed that the actual number of homeless living in the streets was down. On a given night, about 12,934 homeless people stay in a shelter. The number includes families staying in motels on emergency vouchers. The 2013 census notes that 31.4% of the homeless in Los Angeles County are substance abusers, 30.2% are mentally ill, and 18.2% have a physical disability. The census also notes that 68.2% of the homeless are male, 38% are African American, 37% are Caucasian, 28% are Hispanic, and 57.6% are between 25 and 54 years old. In its January 2013 census, Los Angeles County counted 39,463 people sleeping on the street or in homeless shelters. When including persons sleeping on private property with permission to stay no more than 90 days, the estimated number of homeless in Los Angeles County is 57,737. The number of people in the latter category, called "precariously housed" or "at risk of homelessness", was estimated by means of a telephone survey. The number of homeless in Los Angeles County, including the precariously housed and at risk of homelessness, was 51,340 in 2011, of which 23,539 were in the City of Los Angeles, and 4,316 were in the 50 block area east of downtown Los Angeles informally known as  It is estimated that 190,207 people are homeless in Los Angeles County at least one night during the year. In Indianapolis, Indiana, as many as 2,200 people are homeless on any given night, and as many as 15,000 individuals over the course of a year. Indianapolis is notable among cities of similar size for having only faith-based shelters, such as the century-old Wheeler Mission. In 2001, Mayor Bart Peterson endorsed a 10-year plan, called the Blueprint to End Homelessness, and made it one of his administration's top priorities. The plan's main goals are for more affordable housing units, employment opportunities, and support services. The Blueprint notwithstanding, Indianapolis has criminalized aspects of homelessness, such as making panhandling a misdemeanor; and the City-County Council has twice (in April 2002, and August 2005) denied the zoning necessary to open a new shelter for homeless women. Homeless advocate and urban designer Michael E. Arth proposed building a Pedestrian village for the adult homeless in Volusia County near Daytona Beach, Florida in 2007. As of 2009, Arth was still working toward trying to consolidate most of the scattered 19 local agencies into an attractive community that would be designed to more effectively address the needs of the chronically adult homeless and the temporarily adult homeless, as well as others who may be having difficulty fitting into the pervasive, automobile-dominated culture. He writes that the current "piecemeal approach" inefficiently spreads out services and work opportunities, and aggravates the problem by polarizing citizens who might otherwise be inclined to help. In response to critics who say that such a village would be like a concentration camp, Arth points out that the U.S. already concentrates their citizens into prisons at 7–8 times the rate of Canada or Europe. "There should be alternative between living on the street and being locked up that addresses the needs of the chronically and temporarily adult homeless." His proposed "Tiger Bay Village" would have a community garden and orchard, a place to hire certified workers, and a work crew to help build and maintain the village. "Little shops in the village center could process and rehabilitate donated clothes and furnishings to be sold to the public." Housing would range from multi-bed barracks to small Katrina cottages depending on a person's contributions to the village, special needs, and income. Arth claims that this would cost less and be far more effective than any of the other solutions tried elsewhere. While Mayor of Denver, Colorado, Colorado Governor John Hickenlooper made dealing with the issues that underlie homelessness a top priority on his Mayoral agenda, speaking heavily on the issue during his first "State of the City" address in 2003. While Denver's homeless population is much lower than other major cities, the homeless residents have often suffered when without shelter during Denver's infamously cold winters. Now officials have said that this number has risen over the past few years. The city of Chicago, Illinois is also noted for its number of homeless people. Over the years, Chicago has gained a reputation as the city with the most homeless people, rivaling Los Angeles and New York, although no statistical data have backed this up. The reputation stems primarily from the subjective number of beggars found on the streets rather than any sort of objective statistical census data. Indeed, from statistical data, Chicago has far less homeless per capita than peers New York, and Los Angeles, or other major cities such as Philadelphia, San Francisco, and Boston, among others, with only 5,922 homeless recorded in a one night count taken in 2007. The 2011 point-in-time count by HUD took place during the last two weeks of January 2011, and data reported at that time and gathered from service providers in local communities was used to compile the 2010 Annual Homelessness Assessment Report which was released in the middle of 2011. The Vision of the Plan is: "No one should experience homelessness – no one should be without a safe, stable place to call home." The first year of the new decade saw a renewed commitment from the Federal government in its efforts to prevent and end homelessness with the creation and release of Opening Doors: The Federal Strategic Plan to Prevent and End Homelessness. Opening Doors is a publication of the U.S. Interagency Council on Homelessness, which worked with all Federal agencies and many state and local stakeholders on its creation and vision, setting a ten-year path for the nation on preventing and ending all types of homelessness. This Plan was presented to the President and Congress in a White House Ceremony on June 22, 2010. The Federal government contains one agency that focuses on the issue of homelessness in America, and it has had a much greater role in the policy community since its revitalization at the beginning of the decade and its continued appropriations in the HEARTH Act. The United States Interagency Council on Homelessness (USICH),a federal agency contained in the Executive Branch, was established in 1987 as a requirement of the McKinney-Vento Act of 1987. Since its revitalization in 2001 as an agency independent from the Executive Office of the President and reauthorization in 2009, USICH serves as the coordinating body of all 19 federal agencies and their programs and initiatives to serve the homeless population. Its mission is to, "coordinate the Federal response to homelessness and to create a national partnership at every lever of government and with the private sector to reduce and end homelessness in the nation while maximizing the effectiveness of the Federal Government in contributing to the end of homelessness." USICH has taken on a much greater role in Federal-level initiatives to end homelessness in the United States since exiting the Executive Office of the President and notably since the enactment of the HEARTH Act, in which it was mandated that USICH provide leadership in developing a national strategic plan to prevent and end homelessness. Since its authorization as an independent agency, USICH been able to work with stakeholders across all government sectors and at all levels to promote collaboration and best practices within the homeless service provider community. In February 2009, President Obama signed the American Recovery and Reinvestment Act of 2009, which was part of the President's effort to save or create 3.5 million jobs in the United States to mitigate the effects of the economic recession begun in 2008. Part of the Act addressed homelessness prevention, in which he allocated an additional $1.5 billion to HUD for the "Homelessness Prevention and Rapid Rehousing Program (HPRP)." The purpose of HPRP was to assist individuals and families who are otherwise healthy and not chronically homeless in escaping homelessness or preventing homelessness of the vulnerable population. HPRP grant monies were distributed to localities in the same formula used for Emergency Shelter Grants (ESG) in amounts not to exceed $500,000 and must be used within three years. Primary grantee activities include short-term and medium-term rental assistance and housing relocation and stabilization services, including mediation, credit counseling, security or utility deposits, utility payments, moving cost assistance, and case management. There were about 643,000 sheltered and unsheltered homeless persons nationwide in January 2009. About two-thirds of those stayed in emergency shelters or used transitional housing programs, with the remaining living on the street in abandoned buildings or other areas not meant for human habitation. 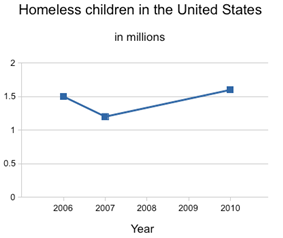 About 1.56 million people, or about 0.5% of the U.S. population, used an emergency shelter or a transitional housing program between October 1, 2008 and September 30, 2009. Around 44% of homeless people were employed. In 2001, the NAEH along with the U.S. ICH encouraged communities to create and implement state and local strategic plans to prevent and end homelessness, focusing on Housing First initiatives to house the chronically homeless population who have many barriers to stability, a cost-benefit analysis of state- and local-level resources, best practice engagement and service innovations, and prevention. Many communities and states across the country have created these plans and have set up measurable goals and targets for the short- and long-term. ^ Donohoe, Martin, M.D., "Homelessness in the United States: History, Epidemiology, Health Issues, Women, and Public Policy", Ob/Gyn & Women's Health journal, 2004;9(2) July 7, 2004. ^ The 2012 Point-in-Time Estimates of Homelessness. 2012 Annual Homelessness Assessment Report. Washington, D.C.: The U.S. Department of Housing and Urban Development, 2012. ^ "Facts and Figures:The Homeless". PBS. 2009-06-26. ^ "The 2013 Annual Homeless Assessment report (AHAR) to Congress". The U.S. Department of Housing and Urban Development. p. 42. ^ Vacant Houses Outnumber Homeless People in U.S. Truthdig, 31 December 2011. Retrieved 12 May 2014. ^ a b Hunger and Homelessness Survey. A Status Report on Hunger and Homelessness in America’s Cities: A 25-City Survey, 2008. ^ (2010)"et. seq. "Runaway and Homeless Youth Act, 42 U.S.C. § 5601 . Retrieved 2013-06-25. ^ (2010)"et. seq. "Head Start Act of 1981, 42 U.S.C. § 9801 . Retrieved 2013-06-25. ^ (2010)"et. seq. "Violence Against Women Act of 1994, 42 U.S.C. § 13925 . Retrieved 2013-06-25. ^ (2010)"et. seq. "Public Health Service Act, 42 U.S.C. § 201 . Retrieved 2013-06-25. ^ (2010)"et. seq. "Food and Nutrition Act, 42 U.S.C. § 2011 . Retrieved 2013-06-25. ^ (2010)"et. seq. "Child Nutrition Act, 42 U.S.C. § 1771 . Retrieved 2013-06-25. ^ (2010)"et. seq. "McKinney-Vento Homeless Assistance Act, U.S.C. § 11301 . Retrieved 2013-06-25. ^ "Homeless Emergency Assistance and Rapid Transition to Housing: Defining "Homeless", Final Rule, 76 Fed. Reg. 75994, 76013-14 (December 5, 2011) (codified at 42 C.F.R. pts. 91, 582, 583)" (PDF). Retrieved 2013-06-25. ^ Center for Housing Policy: Paycheck to Paycheck. ^ Wenzell, SL. "Homelessness Among Veterans: Self-Inflicted or Government Betrayal?". Veteran's Today. Retrieved 28 April 2014. ^ Amland, Bjoehn. "Natural Disasters Displaced 42 Million In 2010; Climate Change Could Be Factor, Experts Say". Huffington Post. Retrieved 28 April 2014. ^ a b Quintana, Nico S., Josh Rosenthal, and Jeff Krehely (June 21, 2010). "Gay and Transgender Youth Homelessness by the Numbers". =Center for American Progress. Retrieved March 16, 2011. ^ a b Treves, Gabe. "More Than 38 Percent of Foreclosed Homes in California are Rentals:Over 200,000 Tenants Directly Affected". California Progress Report. Retrieved 28 April 2014. ^ Willick, Jason. "Homeless by Choice". The Daily Californian. Retrieved 28 April 2014. ^ Lyon-Callo, Vincent (2004). Inequality, Poverty, and Neoliberal Governance: Activist Ethnography in the Homeless Sheltering Industry. University of Toronto Press. ISBN 1442600861. p. 9. ^ Dordick, Gwendolyn A. (March 2002). "Recovering from Homelessness: Determining the 'Quality of Sobriety' in a Transitional Housing Program". Journal Qualitative Sociology 25 (1). ^ VHA Office of Mental Health. "The Department of Housing and Urban Development and VA's Supported Housing (HUD-VASH) Program". .va.gov. Retrieved 2012-06-19. ^ Tsai, Jack; Rosenheck, Robert A. "Homeless veterans in supported housing: Exploring the impact of criminal history". Psychological Services 10 (4): 452–8. ^ "U.S. Department of Labor - ODEP - Office of Disability Employment Policy - Ending Chronic Homelessness through Employment and Housing Projects". Dol.gov. 2003-09-29. Retrieved 2013-08-01. ^ Karash, Robert L., "Housing Lost, Housing Regained, Housing Kept", Spare Change News, Boston, February 25, 2010. ^ Roncarati, Jill (June 2008). "Homeless, housed, and homeless again". Journal of the American Academy of Physician's Assistants. ^ St. Martin, Greg, "Seeking help for homeless on Common: Program hopes to offer housing", Boston Metro newspaper, Monday, September 17, 2007. ^ "U.S. Department of Housing and Urban Development". Hud.gov. ^ a b c d National Coalition for the Homeless Who is homeless?, Published by the National Coalition for the Homeless, July 2009. ^ Urban Institute: Homelessness: Programs and the People They Serve. ^ Substance Abuse and Mental Health Services Administration: How many are homeless? Why?. ^ "Occupational Exposure to Tuberculosis" – OSHA notice, 1997. ^ "Boston's Elderly Homeless Sicker Than Others, Research Finds", Science Daily, September 13, 2011. ^ Stereotyping Based on Physical Attractiveness: Issues and Conceptual Perspectives." Physical Appearance, Stigma, and Social Behavior 3 , Journal, 1986. ^ “Understanding the impact of stigma on people with mental illness.”  World Psychiatry. 2002. ^ Sanders, Hannah. "Panhandling in West Michigan: Report finds many are not homeless". Detroit Free Press. Retrieved 28 April 2014. ^ Keyes, Scott. "Everything You Think You Know About Panhandlers Is Wrong". Think Progress. Retrieved 28 April 2014. ^ Link BG, Schwartz S, Moore R, et al. (August 1995). "Public knowledge, attitudes, and beliefs about homeless people: evidence for compassion fatigue". Am J Community Psychol 23 (4): 533–55. ^ American Sociological Association: "Exposure to the Homeless Increases Sympathetic Public Attitudes", press release, March 22, 2004. ^ Public Agenda: "Compassion, Concern and Conflicted Feelings: New Yorkers on Homelessness and Housing", 2007. ^ Public Agenda: "The Homeless: As Long as They Don't Bother Anybody... ", Red Flags on Poverty, retrieved July 25, 2008. ^ Robbie Couch (3 November 2014). Fort Lauderdale Passes Law That Restricts Feeding Homeless People. The Huffington Post. Retrieved 9 November 2014. ^ Richard Luscombe (5 November 2014). 90-year-old among Florida activists arrested for feeding the homeless. The Guardian. Retrieved 9 November 2014. ^ Evelyn Nieves (31 March 2014). United States Is Cruel, Inhuman and Degrading to Poor, UN Report Charges. Alternet. Retrieved 5 April 2014. ^ Ed Pilkington (13 March 2014). US criticised by UN for human rights failings on NSA, guns and drones. The Guardian. Retrieved 5 April 2014. ^ Wilson Dizard (27 March 2014). U.N. slams U.S. for torture, NSA spying. Al Jazeera America. Retrieved 6 April 2014. ^ U.N. Human Rights Committee Calls U.S. Criminalization of Homelessness "Cruel, Inhuman, and Degrading". The National Law Center on Homelessness and Poverty, 27 March 2014. Retrieved 12 May 2014. ^ "Portal | LexisNexis". Lexisone.com. Retrieved 2012-06-19. ^ St. Martin, Greg, "Night watch: Police removing overnight loiterers on Common", Boston Metro newspaper, Wednesday, August 29, 2007. ^ Dolan, Maura; Maura Holland (2014-06-19). "U.S. appeals court overturns L.A. ban on homeless living in vehicles". Los Angeles Times. Retrieved 2014-06-19. ^ a b National Coalition for the Homeless, Hate, "Violence, and Death on Main Street USA: A report on Hate Crimes and Violence Against People Experiencing Homelessness, 2006", February 2007. ^ Lewan, Todd, "Unprovoked Beatings of Homeless Soaring", Associated Press, April 8, 2007. ^ "Police arrest three teenagers for hammering homeless to death". Albuquerque News.Net. Retrieved 23 July 2014. ^ Salvation Army, "History of The Salvation Army Social Services of Greater New York"
^ "Riding the Rails", American Experience PBS series. ^ Scherl DJ, Macht LB (September 1979). "Deinstitutionalization in the absence of consensus". Hosp Community Psychiatry 30 (9): 599–604. ^ Rochefort DA (1984). "Origins of the "Third psychiatric revolution": the Community Mental Health Centers Act of 1963". J Health Polit Policy Law 9 (1): 1–30. ^ Feldman S (June 1983). "Out of the hospital, onto the streets: the overselling of benevolence". Hastings Cent Rep 13 (3): 5–7. ^ Borus JF (August 1981). "Sounding Board. Deinstitutionalization of the chronically mentally ill". N. Engl. J. Med. 305 (6): 339–42. ^ Cf. Diggers article in WorldHeritage. ^ a b "On The Pine Street Inn". Communityroom.net. Retrieved 2012-06-19. ^ "Programs | Funding & Programs | United States Interagency Council on Homelessness (USICH)". Usich.gov. Retrieved 2013-08-01. ^ a b Common Dreams: Urban Suffering Grew Under Reagan. ^ National Housing Institute: Reagan's Legacy: Homelessness in America. ^ "FACS | Homeless Children, Poverty, Faith and Community: Understanding and Reporting the Local Story". Akron, Ohio: Facsnet.org. March 26, 2002. ^ , USICH, "Developing and Implementing Community Strategic Plans." ^  USICH,"Communities with Strategic Plans". ^ United States Department of Housing and Urban Development, "Homelessness Prevention and Rapid Re-Housing Program"
^ "HPRP Program Details". Case Manager. Retrieved February 24, 2011. ^ "The HEARTH Act – An Overview", National Law Center on Homelessness and Poverty, Washington, D.C.
^ "HUD Press Release, December 1, 2010". Portal.hud.gov:80. December 1, 2010. Retrieved 2012-06-19. ^ "United States Intergaency Council on Homelessness Historical Overivew". Usich.gov. Retrieved 2014-03-07. ^ "Opening Doors". Usich.gov. Retrieved 2014-03-07. ^ Barbara Poppe (June 16, 2010). "Opening Doors | The White House". Whitehouse.gov. Retrieved 2012-06-19. ^ """HUD Homeless Resource Exchange, "2011 Point in Time Count Guidance (PDF). Retrieved 2012-06-19. ^ Arth, Michael, "Why we should build a Pedestrian Village for the homeless in Volusia County." The Daytona beach News-Journal. April 1, 2009. p. 11 A. ^ Loh, Christopher, "City experts predict drop in homeless numbers", Boston Now newspaper, December 20, 2007. ^ "Massachusetts Medical Society and Alliance Charitable Foundation website". Massmed.org. Retrieved 2012-06-19. ^ Mayor's Office, City of Boston, "Mayor Menino Dedicates New Day Center for the Homeless", Press Release, October 14, 2009. ^ Cunningham, Liam, "Cuts Extract Mass Health Dental Benefits From Budget", Spare Change News, July 16, 2010 issue. ^ Commonwealth of Massachusetts, "Healthcare: Governor's FY2011 Budget". "The MassHealth adult dental benefit is restructured to cover preventative and emergency services only, excluding restorative dental services." ^ Banda, Deborah, "AARP Alert: Seniors’ Prescriptions; MassHealth Dental Benefits at Risk", AARP, May 26, 2010. ^ "NYC Department of Homeless Services". Nyc.gov. Retrieved 2012-03-24. ^ "San Francisco's homeless count reveals drop in chronic homelessness | Bay City News | Local | San Francisco Examiner". Sfexaminer.com. Retrieved 2012-06-19. ^ a b "Recordsetting homelessness in New York City - World Socialist Web Site". Wsws.org. 2011-04-26. Retrieved 2013-08-01. ^ "NYC Program To Help Homeless Won’t Have The Funds To Help More « CBS New York". Newyork.cbslocal.com. 2011-03-11. Retrieved 2013-08-01. ^ "Coalition for the Homeless Says Homelessness in New York City Has Reached Record Levels & Blames Policies of Mayor Michael Bloomberg « CBS New York". Newyork.cbslocal.com. 2011-04-11. Retrieved 2013-08-01. ^ "Chronicle Homeless Special". SF Gate. January 16, 2004. Retrieved 2012-06-19. ^ Cheng, Alexandra, "Are Peace and Love Dead in San Francisco? ", Spare Change News, Boston, July 2, 2010. ^ Wiener, Aaron. D.C. Homeless Population Rises, Despite National Decline. Washington City Paper, November 22, 2013. ^ DC's homeless do it tough as winter rolls through. ABC News, November 25, 2013. ^ Wiener, Aaron. D.C.’s Homeless Shelter Crisis, by the Numbers. Washington City Paper, November 26, 2013. ^ Wiener, Aaron. Winter’s Coming. Is the City Ready to Shelter Its Homeless? Washington City Paper, October 29, 2013. ^ "Homeless Man Sues Library, Police, Wins $250,000". Pittsburgh Post-Gazette (Google News). March 10, 1992. ^ "Libraries And The Homeless: Random Thoughts". thehomelessguy.blogspot.com. January 28, 2010. Desjarlais, Robert R., Shelter blues: sanity and selfhood among the homeless, University of Pennsylvania Press, 1997. A particular study of the homeless in the Boston area. Koebel, C. Theodore (1998). Shelter and Society: Theory, Research, and Policy for Nonprofit Housing. SUNY Press. Levinson, David, [editor] (2004). Encyclopedia of Homelessness. Thousand Oaks, California: Sage Publications. National Coalition for the Homeless. (2009, July) Homes Not Handcuffs: The Criminalization of Homelessness in U.S. Cities. Retrieved December 13, 2010, . Schutt, Russell K., et al., "Boston's Homeless, 1986–87: Change and Continuity", 1987. Schutt, Russell K., Feldman, James, et al., "Homeless Persons’ Residential Preferences and Needs: A Pilot Survey of Persons with Severe Mental Illness in Boston Mental Health and Generic Shelters", 2004. "Of No Fixed Address: A Collection of Voices from the Streets of Chicago"
City Mayors Society – "Hunger and homelessness continues to rise in US cities"
City Mayors Society – "Report accuses US cities of criminalising the homeless"
City Mayors Society – "Big US cities report steep rise in hunger and homelessness"
National Housing Institute – resources, information, and publisher of "Shelterforce", The Journal of Affordable Housing and Community Building. Homeless in America. Al Jazeera America. The United States government acknowledges four categories of people who qualify as legally homeless: (1) those who are currently homeless, (2) those who will become homeless in the imminent future, (3) certain youths and families with children who suffer from home instability caused by a hardship, and (4) those who suffer from home instability caused by domestic violence. Homeless man in the East Village, New York City. • 38 percent have a disability. • 64 percent are in one-person households. • 38 percent are 31-to-50 years old. • 62 percent are members of a minority group. • 61 percent are male. • 78 percent of all sheltered homeless persons are adults. According to the Stewart B. McKinney Act, 42 U.S.C. § 11301, et seq. (1994), a person is considered homeless if he or she "lacks a fixed, regular, and adequate nighttime residence and ... has a primary nighttime residency that is: (A) a supervised publicly or privately operated shelter designed to provide temporary living accommodations... (B) an institution that provides a temporary residence for individuals intended to be institutionalized, or (C) a public or private place not designed for, or ordinarily used as, a regular sleeping accommodation for human beings." Human Rights Watch (2010) identified emancipated teenagers in California as a new homeless population.